Everyone knows this is the next development in shipping, but who will take the lead? This is the feeling shared amongst everyone in on the movement, especially during and after the recent Harlingen, Holland meeting of organizations and activists interested in the Ecoliner -- a hybrid sailing ship designed for timely delivery of cargo with minimized pollution. 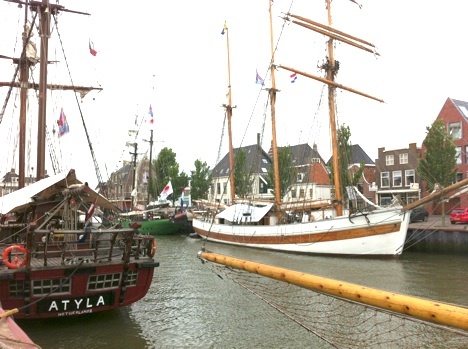 Attendees were inspired by 65 tall ships gathered in Harlingen for a race and public outreach extravaganza. 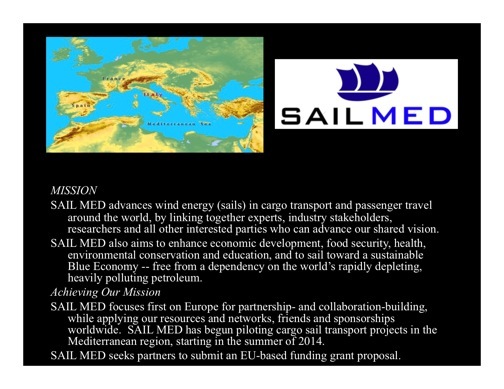 The final year of the grant for the SAIL consortium's Ecoliner mission began this month, so it is fortunate the project is on schedule and rolled out for investors, shippers and bankers. Concurrent with the regular SAIL meeting in Harlingen 3-4 July, a separate SAIL Networking Meeting was held aboard the Stad Amsterdam on 4 July. 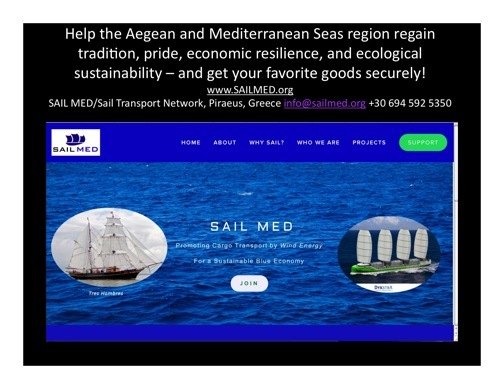 A lively discussion ensued, with environmentally minded Ecoliner advocates pressing the maritime industry and corporate leaders to recognize a progressive opportunity now. 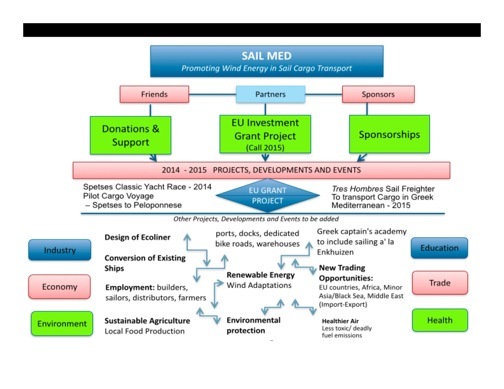 The Ecoliner ship-design and business plan has been making headway with the EU-funded SAIL since 2012. Now, big business has been given its first public look. Not only their input but financing and freight-commitments were sought. But the historic meeting, aboard the Stad Amsterdam tall ship, featured friction between those hesitating on the Ecoliner and on sail transport in general, and those committed but impatient about transporting more goods by sail. Some of my fellow speakers and I seized upon the unfair externalizing of pollution costs generated by conventional cargo ships -- just 16 of them emit as much sulfur and other pollutants as all the world's cars. The climate threat is the elephant in the room that some think can still be ignored. But as I have done in previous SAIL meetings, I also emphasized the enormous subsidies afforded the oil industry and oil consumers. This hidden cost has the effect of driving up unseen the cost of all goods involving petroleum for transport or production. As the subsidy-cost grows, there will be a breaking point for the consumer economy. The effects of the subsidies and externalizing are hurting people already, but are called other names, such as "lackluster growth," "lame recovery," or the end of the Middle Class. 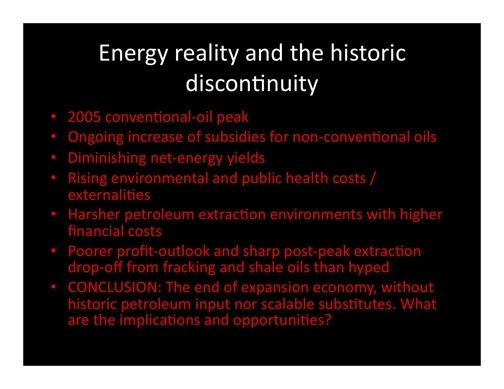 As always I pointed out that oil supply is insecure -- contrary to the expectations of most of the maritime industry -- due to (1) an inevitable but unpredictable geopolitical event that will cut off a significant amount of supply for the oil market and the global economy, and (2) the historic passing of easily produced, high-quality oil extraction that peaked in 2005, bringing on greater and greater environmental damage through unconventional, hard-to-access oil, while yielding lower and lower net energy. 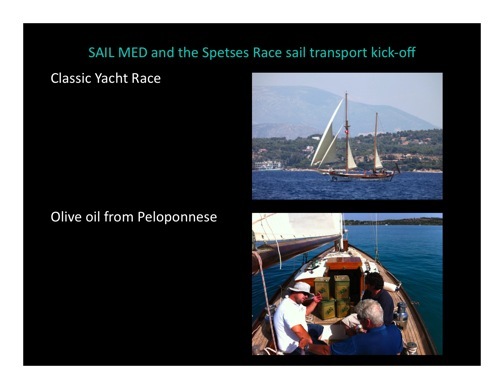 The Ecoliner, however, is not purely sail-powered, and can use petroleum (or other renewable-energy powered motor thrust) with the best of them while supply lasts, subsidies persist, and pollution is externalized. 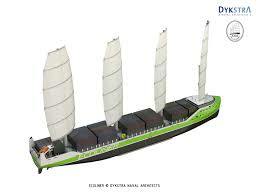 The objection against the new design turns out to be not its speed, but only its size, thereby reducing cargo volume. At 150 meters, it is dwarfed by Maersk's 400-meter 'Triple-E' class behemoths which will carry 18,000 TEU containers. 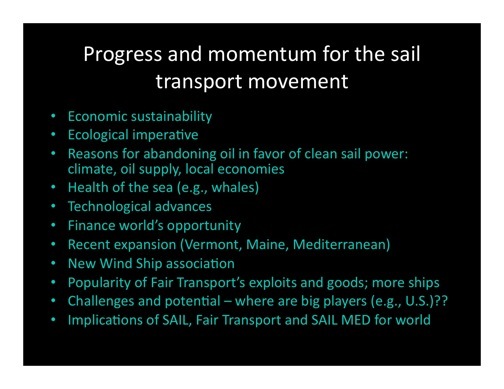 But any disadvantage in economies-of-scale in the Ecoliner is offset by the growing premium market-niche of sail-transported and organic goods. 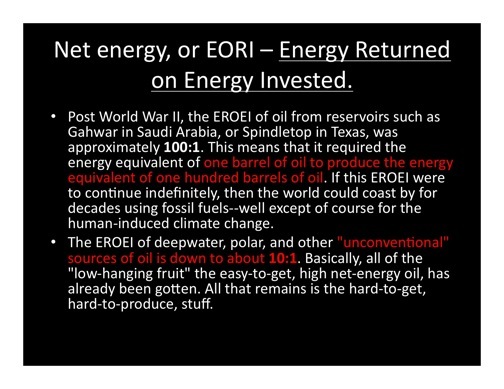 And, obviously the Triple E's are still just oil boats, despite fuel efficiency improvements, so a "greener" oil boat is still vulnerable to petrocollapse. At the Networking Meeting, that included bankers, ship owners, and major corporate firms (principally Heineken), hard-nosed business leaders got an earful in addition to the usual powerpoint-presentation format. In an unexpected, animated free-for-all, big business was comfortably on the defensive. It seemed that none present had the authority or the guts to say, "Yes, my company would like to be first for Ecoliner shipping to slash oil use and aid the atmosphere." Not even close; rather, the attitude was one of "Show us the guaranteed profit and done deals before we can consider rocking the status-quo boat." A software entrepreneur for solar-energy powered small boats was vocal in requiring up front all the proof and guarantees of a business venture if sail transport is to fly, yet he is one of many who had broken the mold somewhere along the line and profited. The 17-partner SAIL team for the Ecoliner's complete utilization is together, and will continue to iron out regulatory and business/wind-route details. If the ship could appear tomorrow, it would be utilized efficiently for cargo, receive hugely favorable publicity, and be a game changer. I told the audience, "The Ecoliner can be thought of as having a sail option. So for you it is the best of both worlds. 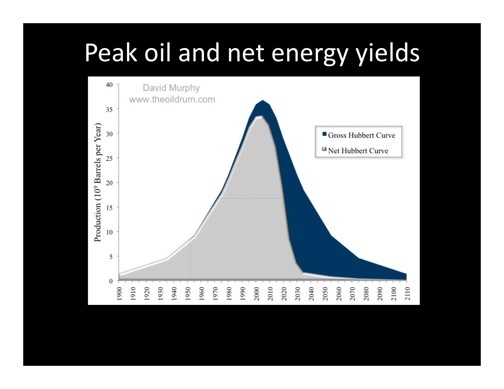 You can't know when an oil crisis will make business-as-usual impossible for your industry. Now is the time, if you can accept lower volumes of cargo and see greater value from niche-market cleanly transported goods." 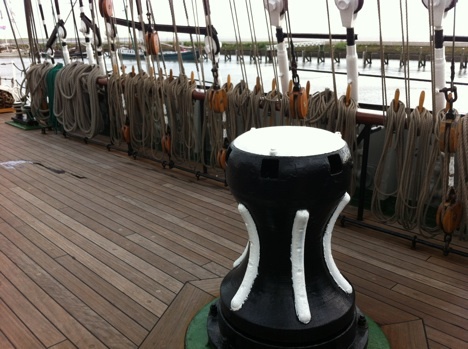 No doubt the meeting and subsequent conversations on the Stad Amsterdam deck with fine food and drink (Heineken on draft, especially) will reverberate and propel someone to take action -- some day. Follow-up is already under way. 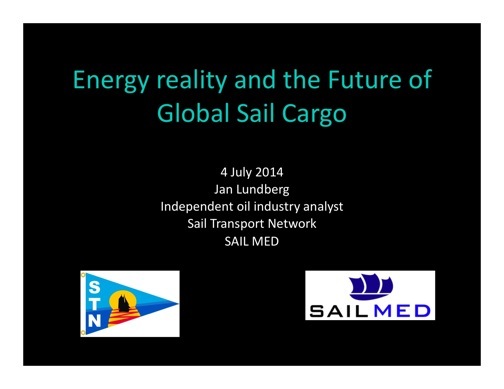 Scroll down to see Powerpoint presentation slides by Jan Lundberg, independent oil industry analyst of Sail Transport Network and SAIL MED. 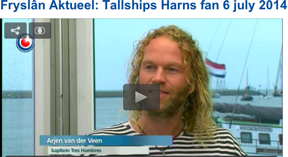 Arjen van der Veen from Fair Transport, one of the three captains of the Tres Hombres schooner brig appeared along with others on television in Fryslân (Holland's northeast province) on July 6, 2014 -- in Dutch, but good footage in any language. 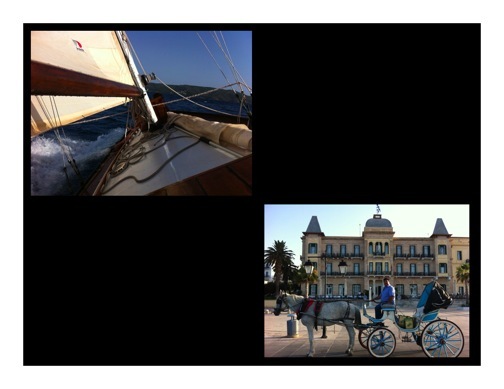 Video of Jan Lundberg's talk and an interview by Iekje Smit, and other footage from the SAIL meetings, is to come.